Tidbits: To the family and friends of Dean and Steven Beachy, my sincerest condolences. Harness racing lost another gem with Dean’s passing. RIP my friend, you will truly be missed. You may think I am crazy but there are times when I think the population is growing faster than all the new technology. I got a new credit card from Sun Trust Bank and after receiving it I went online to register in order to pay the bills. After many tries, to my dismay the website would not accept the existence of the card that I physically held in my hand. So, I went to the bank to explain the problem and the banker said, “I really have no idea how to get you registered, but sit down have a cup of coffee and I will contact the main office and we will get you registered. After waiting while he was on hold for 45 minutes I got up thanked him and went to the teller and paid my bill. I gave it one more try on the phone and got a bit further, except I was supposed to receive an email with a secret code within 15 minutes. That was two weeks ago and still no email. Today, I got a new SunPass. I spent 10 minutes online to register it and when it came time to enter my car information, a note popped up this page is not available at this time. Thinking I had another option I called the 800 number requesting to activate it via telephone and a voice said all our representatives are helping other customers please stay on the line and your call will be answered in the order we received it. Approximate waiting time 37 minutes. I waited a bit and called back only to hear “we have more than expected call volume at this time please call back later. “ GET MY POINT. Hearty congratulations to Wally Hennessey for win number 10,000 to which I contributed very little, but one was a Breeders Crown. Kudos to TVG for broadcasting the Prix D’Amerique with an English race call, although I speak a little French, the race itself was better received in my own language. You may be surprised to know that HRU has fans all over the world. I have been receiving some interesting emails from all over Europe, and Australia and New Zealand. From now on when a question comes from overseas I will note the country of origin in the answer. I thought the video production of the Pegasus race card from Gulfstream was wonderful, especially considering the horrible weather that made the conditions unbearable to many. The rain caused too many scratches when Turf races were moved to the dirt, which sadly lessened the overall handle. Oddly enough, they still had a paid attendance of over 14,000, which in itself was amazing. 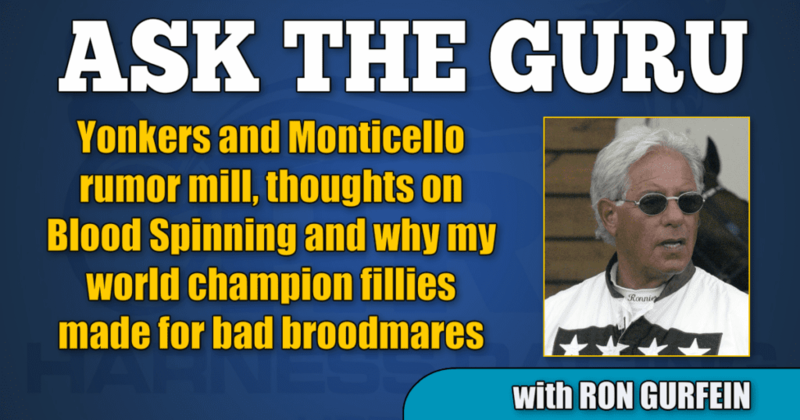 Paul Summers asks: How do you theorize the reason for all the world champion fillies you trained having very little in the line of great or even good performing foals? I am pretty sure I have an answer to that as I have had many years to mull it over. As a matter of fact, some of the fillies I purchased were failures on the racetrack and had great success as broodmares. Franconia, Cayster, Kerry’s Crown, Imperfection, Beat The Wheel, and Continentalvictory were all top racemares and had little to brag about in the breeding shed. Beat The Wheel had a good filly, but not one of the others had anything that resembled a star colt or filly. They all had one thing in common in my personal opinion, they all lacked pedigree. If you research their families none have been very productive in recent time. On the other hand, I bought a bunch of fillies that had no talent on the racetrack that turned out to be five star broodmares. Included in that group were Cressida Hanover dam of Hambletonian winner Glidemaster 3, 151.1 $1,968,023, Meadowbranch Magic with seven winners in her first seven foals including Make It Happen 3,154.4 $947,829 and Wishing Stone 151.2 $2,359,150 and Gala Dream, dam of Pastor Steven 3, 152.4 $1,048,607 and Father Patrick 3, 150.2f $2,558,133. The success of the dolts over the champions teaches us an interesting lesson. The three mares I have just mentioned have wonderful pedigrees and were all near perfect individuals. The families are very much alive today. This is born out by the fact that Meadowbranch Magic and Gala Dream cost $335,000 and $100,000, respectively, and Imperfection $10,000, Franconia $1,200 Beat the Wheel a homebred that would not have commanded $10,000 as a yearling. The name of the game is PEDIGREE, PEDIGREE, PEDIGREE. Jeff Cantine asks: I understand that Yonkers and Monticello are both closing this year, please give me the low down on the situation as you know it. I know no such thing is in the cards, but to be certain I went to the proper sources. However, the plan in place as of now is that racing will go on indefinitely. Shawn also brought up the subject of the Zeron dilemma with Atlanta’s year-end honors. He said as president of the U.S. Harness Writers it was a tough decision to make. I assured him that I agreed 100%. This is still America and innocent until proven guilty must continue to prevail. He also brought up the possibility of a merger with Yonkers Raceway. He also said his take from “the whispers in the background “ was that MGM would like to see Yonkers relocate, that’s where the Monticello merger rumor came from, but Faraldo would prefer to see them build a brand new facility in Orange County, which would create some new excitement in the industry. However if that was not to be, having Belmont Park and NYRA’s people adjust that plant to accommodate harness racing would be another positive alternative. STAY TUNED. David Phillips (New Zealand) asks: One modern day performance enhancer in our country is called Blood Spinning. It involves spinning blood to a more concentrated form. Then in the days approaching a big race the blood is injected IV to increase the amount of oxygen readily available during the race. In New Zealand it is legal, albeit expensive. Did you ever use the blood spinning system? What do you think of this system as an animal welfare issue? Are you aware of trainers in North America using this system? I have used what you call blood spinning for a very long time. However, never as a prerace but as a therapeutic agent. Many years ago, my friend Dr John Cummins fell in love with the process and was using it to replace the more expensive hyaluronic acid when injecting joints and even soft tissue. Do I think it works well, sometime but I personally prefer acid. I called John to ask about the blood doping quality of the process and he said he knew of no one that was using it for that purpose. I am sure that with the power of the Internet that if it is widely used Down Under it is used in North America. If for some reason, it has gone unknown, after this article is published lots of trainers will try it. As far as animal rights issues are concerned, all blood doping should be banned because there is a narrow line between providing more oxygen and coagulating the blood and if one horse dies because of this procedure to me it is one too many. To all my readers, thanks for all the kind words, please keep the questions coming and hopefully weather will permit me to resume The View From The Deck in Sunday’s HRU. Have a question for The Guru? Email him at GurfTrot@aol.com.